The UO’s Hayward Field will host the IAAF World Championship track and field meet in 2021, marking the first time the international competition has been held on United States soil. According to the IAAF, the nine-day biennial championships will be the largest sporting event in the world in 2021. Almost 2,000 competitors representing as many as 213 different countries will be in Eugene to compete. It will also be the largest event ever held at Hayward Field. The vote to award the games to Eugene came in a special vote by the 27-member IAAF Council during meetings in Beijing. The bid was organized by USA Track & Field, the sport’s national governing body, along with the city of Eugene and TrackTown USA, which is the local organizing committee. The decision to award the 2021 games to Eugene and the UO came less than six months after a close vote by the IAAF awarded the 2019 championships to Doha, Qatar, over Eugene. It will be the first time in the 33-year history of the IAAF World Champioships that the event has been hosted by a city in the U.S.
“In hosting this meet at historic Hayward Field, on the beautiful University of Oregon campus, we believe we can ignite a spark that will leave a lasting legacy for track and field for generations to come,” Lananna said. 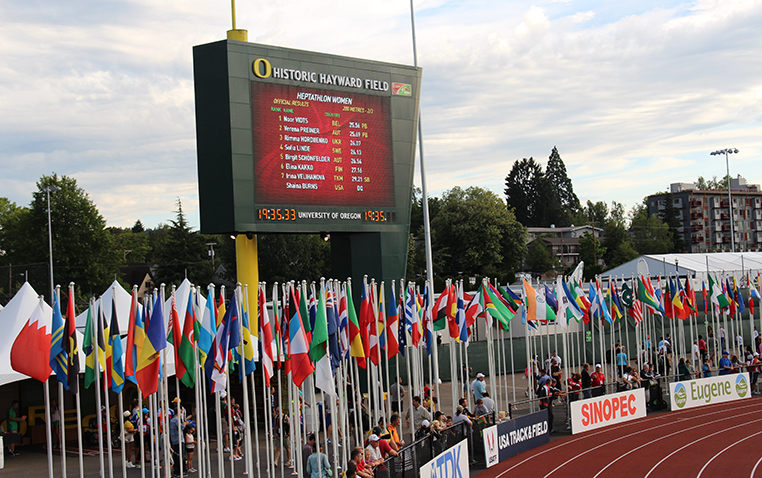 The UO hosted the IAAF World Junior Championships last summer. The university also hosted the U.S. Olympic Track and Field Trials five times, most recently in 2008 and 2012, and will welcome the trials a sixth time in 2016. Also, the 2016 IAAF World Indoor Championships will be held at the Oregon Convention Center in Portland.